I really love traditional comfort food such as sausages and mash. After a busy day at school and clubs “Bangers and Mash” is a fulfilling meal for the kids too. It’s also a quick and easy meal for me to make (the ready made sausage and gravy short cuts really come in handy during the midweek rush). I always add veggies to our mash to get as much goodness in as I can and as it’s St Patricks Day today I decided to add kale and leeks to make a vegan version of colcannon. Peel and chop the potatoes. Season with a little salt and boil over hob for 20 minutes (until soft enough to mash). Meanwhile, grill the vegan sausages according to instructions (usually 10-15 minutes). Chop the leeks and throw into saucepan. Cover with soya milk, add mace, nutmeg and pepper to season. Stir well and leave to simmer until tender. Turn the vegan sausages. Turn grill off once fully cooked but leave sausages under grill to keep warm. Take the cooked potatoes out of the pan. Add the kale to the boiling water to cook for five minutes. Drain kale. Add soft potatoes to empty pan. Mash potatoes well. Add the tender leeks in soya milk and give a good stir. Add the lightly boiled kale and stir well. Make a well in the colcannon mixture. Add 2 tablespoons vegan margarine and stir well as the dish is fully heated ready to serve. Make up the vegetable gravy according to instructions. 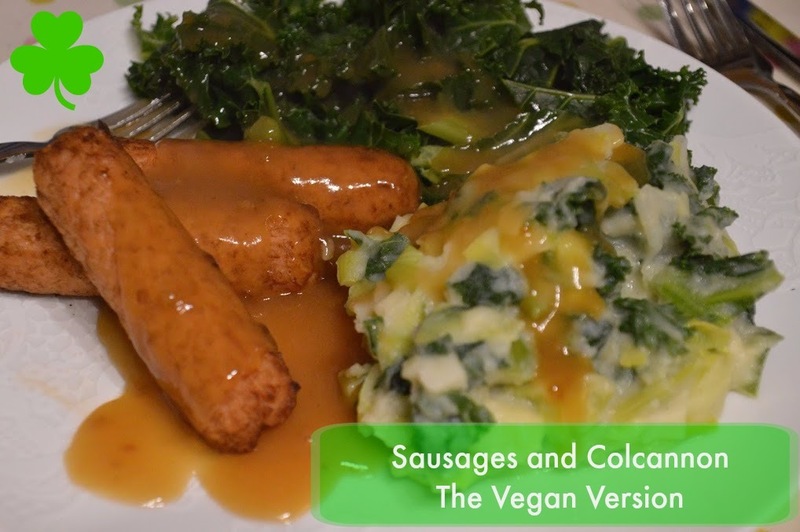 Serve the vegan sausages, colcannon, vegetables (I used left over kale). Pour over gravy and enjoy! Of course, if you do eat dairy, you can switch the soya milk and butter for your regular dairy options. Wishing all my Irish friends and family a lovely St Patrick’s Day, I can’t wait to jump on the ferry and visit Ireland again soon! What Irish dish will you be enjoying today? I love colcannon, we always make it on Boxing day with left over Brussels sprouts.